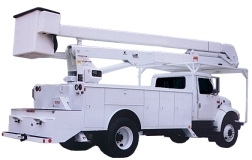 The term Dielectric Bucket Truck Testing is a contraction for high potential, which means high voltage testing. Hi-pot testing has more commonly been further shortened to Dielectric Bucket Truck Testing which becomes a widely accepted term for the process for applying high voltage to a device in order to determine the status of its electrical insulation. Although Dielectric is a commonly used word, there are many it has many terms with similar or identical meanings. Voltage withstand testing, dielectric strength testing and insulation breakdown testing and are popular terms synonymous with Dielectric Bucket Truck Testing.